Win10Pcap is a new WinPcap-based Ethernet packet capture library. Unlike original WinPcap, Win10Pcap is compatible with NDIS 6.x driver model to work stably with Windows 10. 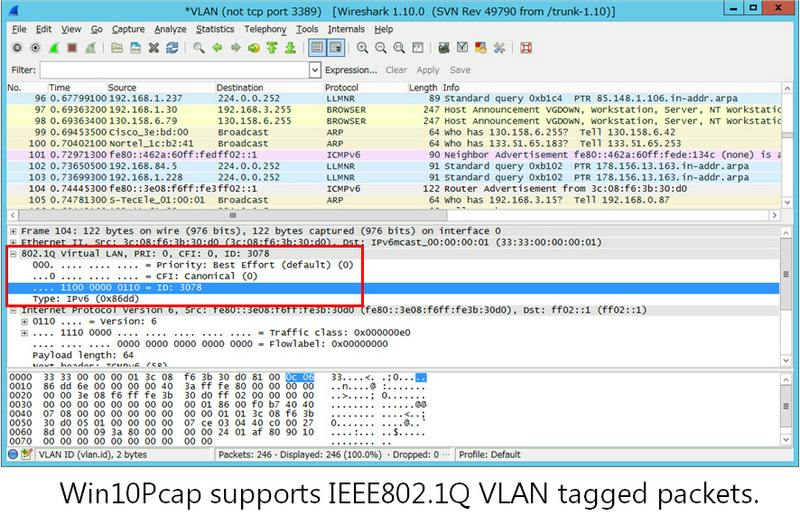 Win10Pcap also supports capturing IEEE802.1Q VLAN tags. 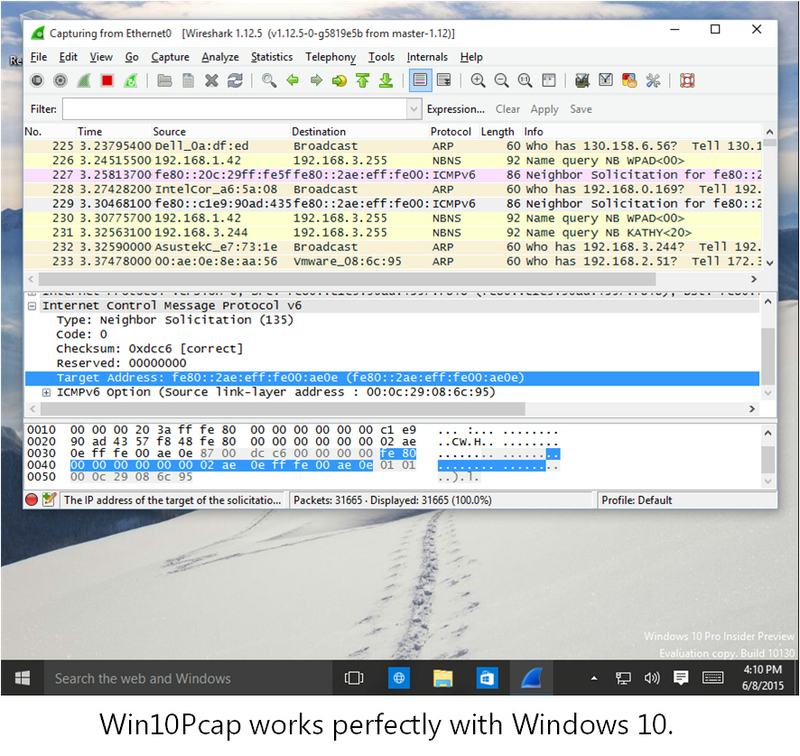 Win10Pcap has the binary-compatibility with the original WinPcap DLLs. You can run Wireshark or other WinPcap-compatible applications with Win10Pcap by simply installing Win10Pcap DLLs, instead of original WinPcap. Win10Pcap is written as a personal project by Daiyuu Nobori, a Ph.D student of Computer Science of University of Tsukuba, Japan. The many parts of Win10Pcap was from WinPcap. Win10Pcap works stably with Windows 10 on both x86 and x64. Win10Pcap is implemented in the NDIS 6.x driver model. Win10Pcap also works with Windows 8.1, 8, 7, Server 2016, Server 2012 R2, Server 2012 and Server 2008 R2 on both x86 and x64. Win10Pcap is open source software under the GPLv2 license. 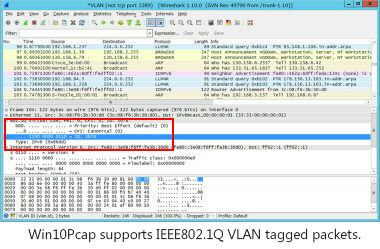 Win10Pcap supports capturing IEEE802.1Q VLAN tags. Win10Pcap fixed the NICs enumeration bug on original WinPcap. WinPcap can enumerate only NICs which were existing on the boot time. Any NICs which are added after the boot time cannot be enumerated. Win10Pcap can enumerate all existing NICs correctly, including NICs which are added after the boot time. Win10Pcap supports Jumbo Frames up to 10,000 octets. 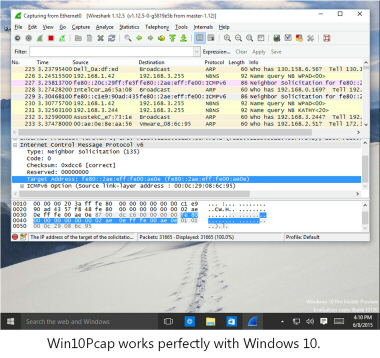 Win10Pcap has the binary-compatibility with the original WinPcap DLLs. The kernel-mode Win10Pcap device driver has obtained the "Windows 10 Compatible" logo from Microsoft on June 8, 2015. What's different with original WinPcap? Original WinPcap is a great packet capture library. However, WinPcap has been implemented based on the NDIS 5.x driver model. We integrated the WinPcap codes into the NDIS 6.x driver model to work stably with Windows 10. We also added the code to support the capability to capture IEEE802.1Q VLAN tags in Ethernet frames which the original WinPcap has not supported.